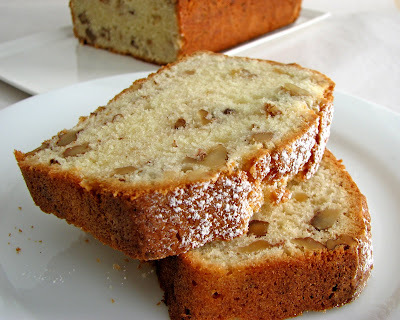 I recently posted about a walnut bread too :) Love your brandied version! I'm totally going to make this next week. I have been lurking and have tried some of your less fancy recipes: oatmeal banana bread, ma'amoul, rosemary-apple galette, buttermilk pie. You rock! The sugar level is always perfect, along with all the other flavors. Also, your directions and notes are super clear and helpful. The brandy in here makes this really festive. I imagine washing it down with some egg nog! Veggie Girl, you have such a unique blog and such a great following. 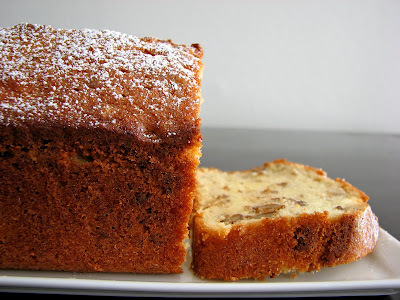 You Walnut Date Bread looks perfect! regi, thanks so much for commenting! I do try to make pastries and desserts that do not taste of sugar. Rather, I want the other natural ingredients to shine. That's an attitude I've always had but it got strengthened when I was at Chez Panisse. I've been thinking about writing about this, actually. Antonietta, I was actually thinking the same thing as I was tasting it and forgot to mention it in the piece. Although I love the flavor, I usually can only handle half a sip of egg nog. I'm a wimp when it comes to the real rich stuff! I love this combo. Recently made a walnut/brandy compote of sorts to serve with a brie quesadilla...so good. What makes it more special is the brandy that was put in the bread! It made it more festive! And it looks easy,too. I'm loving this recipe- the brandy makes it seasonal and it is just so darn pretty! 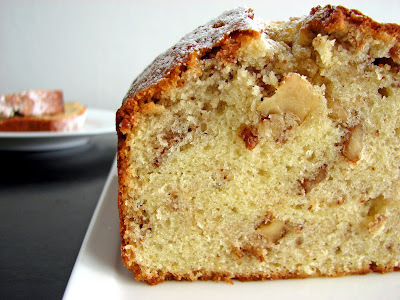 I've never cared for walnuts, but their bitterness would be perfect in this cake. Anonymous - yes, that's the spirit! I think Frangelico is slightly sweet, but shouldn't make a big difference. Go for it! I made it. Used pecans and buttermilk because that's what I had. DELICIOUS! Thanks, regi! Glad you enjoyed it. This looks like a really lovely cake. I can't wait to try the recipe. Happy Holidays! Made this last week and it was really lovely. Not too sweet, either. With some whipped cream spiked with more brandy, it was just about perfect. Thanks! Thank you, saturday mike. I like your idea for the whipped cream! Would also be good with egg nog or brandy ice cream. i love brandy in desserts!